I slept in this morning until 9 am. Even my dog slept in. I’ve been getting up early every Saturday morning for a 9:30 appointment. I don’t have to anymore. Yeah! It was so nice to sleep in but now I’m so lazy that I don’t want to do a thing on such a gorgeous day. I spoke to my friend in Rome this morning. It seems as if she’s been gone much longer than a month. I could hear contentment in her voice; something I haven’t heard in a long time until she made the decision to move to Italy. It’s no question that Italy is magical if the heart is open for that kind of joy. Now I’m trying to decide when do I want to make my trip to Italia. I will definitely go between September and October. Of course my representation might be a little angry for my choice of time to go to Italy. Things tend to start up again in the land of television. But I only have one life to live. Besides, I’m trying to create work in other places and not limit myself to just L.A. I was told by a few people to refrain from coming to Italy in November again. I enjoyed seeing the beautiful leaves in the Fall; however my Italian friends seemed to be incredibly busy with work in November to enjoy the colors that surrounded them as I was free to do. I didn’t mind that everyone was busy because we made the most of the time we did have together. I’m told that business slows down in December so Italians are cramming everything in business-wise before shutting down for the Christmas holidays. The NBA playoffs started and being the big sports fan that I am; I could sit in front of the TV this entire day and watch the games. I know that if I get caught up in good game, I will NEVER get anything done. Truth is, I don’t feel like doing anything so perhaps I’ll just listen to my body and just do….nothing. 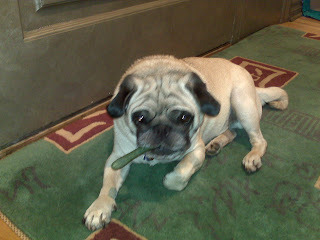 Oh here comes Guido Panini (photo) wanting to go out again for a walk. Now here’s something I will have to do….take the dog for a walk. We won’t be outside very long. It’s too hot and my dog hates the heat.